I would love to have my Saint Padre Pio items blessed by you. You do not carry any items of Saint Padre Pio and I have found this man to have been a very interesting and strong healer. I have a couple of items that I would like to have blessed but I am not Catholic and this area is really strict in the Catholic community (something I cannot understand) If I sent these things to you would you be kind and bless them for me? I do not have a designated anointing oil and have not been able to find any. What do you suggest if you cannot bless and anoint them for me? I don't think Lucky Mojo is in the business of blessing items from other sellers. However you could purchase All Saint's oil, Blessing Oil, or Holy oil and do it yourself. No, lucky mojo is geared towards lucky mojo products. And the great thing about their products are that they are already blessed. I've never had a problem going to a priest and asking them to bless an item for me; I've had everything from rosaries to needlework blessed. That depends on what type of blessing you're looking for, of course - a Catholic priest blessing would be very different from a conjure one, I'm assuming, but if you're looking for a generic blessing, or something short term before you can get the oils you need, I wouldn't think there would be problems in that respect. Miss cat is a reverend, but I don't know if they offering services like blessing items. You can seek out a Catholic priest and they will bless items for you. I have several blessed items, some of them very ritual-oriented and I never had an issue. Rootworkers do offer the option of consecrating and fix items for you. There are several of us workers that offer this service. We can either make talismans, or you send us the objects and we fix them for you. As an inter-faith minister i do indeed bless items for people, and not religious items exclusively. I would be happy to do it, but you would need to send the items and return postage with a self-addressed mailer. I'm doing some work on writing a story, and I was curious about the idea of consecration of holy weapons. Now, I've read a lot of high fantasy, where the builders of holy weapons weave spell craft, runes, blessed metals and such into the creation of a holy relic by petitioning gods and such. My question is more down to Earth; how would a practitioner consecrate a holy weapon; what prayers would be used, and would you think that oils, fire, or some other type of petitioning would be used to something for, say, someone working on this in a modern setting? It would really depend entirely on what magical tradition the maker was practicing. Conjure doesn't really make too much use of ritual implements like daggers and such the way some other magical traditions do, but there are certainly a plethora of different condition products out there that one could use to fumigate or anoint an item that was important to them. Look to the Bible for likely passages they would pray. That being said, the purpose of this forum is for the discussion of the use of Lucky Mojo products, so a purely theoretical occult topic such as this is kinda off target for here. Conjure doesn't rely on many ritual impliments. However conjure doctors do pray, bless, and empower talismans, amulets, and other objects. This is often done by dressing them with oils, praying over them, and smoking them in incense. I think you may want to go to a different occult forum. We don't do "Holy Weapons" here. In this forum, we can advise you about Lucky Mojo products, Missionary Independent Spiritual Church services, and how to contact AIRR readers at the AIRR site. You can become a fan and follow the Hoodoo Rootwork Correspondence Course on facebook. Oh, and folks, no worries; this post for info came out a theoretical discussion between myself and other folks about the subject after seeing this concept in a film; everyone had very creative and interesting theories, and as I've made study of Rootwork intently lately, I wanted to get, as it were, a second opinion. I have no intention (or need, thank God,) to do such things, I just wanted the opinion of those in the know. Again, my thanks for your time, and I'll be sure to be a bit more selective about my topics. Greetings all. So happy to be here, for what is my first post! I have a simple question. 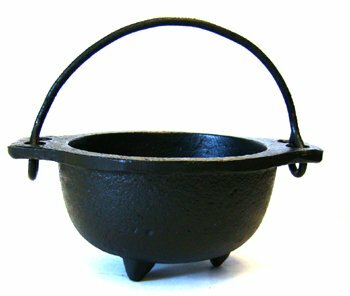 Recently, I bought a small metal cauldron from a thrift store. It has a special place in my kitchen, away from all of the mundane tools, but very much in the heart of the home. Now my formal training falls primarily under the Italian American folk magic camp, but I was wondering if you all know of any down-home prayers or procedures for blessing such tools in Conjure or Hoodoo. Nope, cauldrons are not sacred items in hoodoo (rootwork, conjure) -- which is African American Christian folk magic. They are just kitchen or farm tools, used for cooking, rendering lard, soap-making, and stuff like that. You're in luck, Elvyra and Miss Phoenix hosted a show on Cauldrons in 2016. Thank you all for the thoughtful answers and insight. I will check out the above listing for "The Witch, The Priestess, and the Cauldron." Also, I feel I have a better handle now on how to navigate the forum.